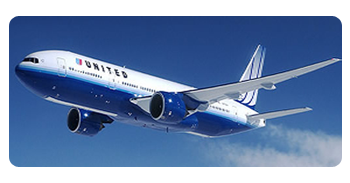 United Airlines is the world's leading airlines with a widespread route network. It manages transcontinental, transatlantic, and transpacific services along with a widespread domestic route network throughout Western United States. United Airlines provides international flights from its main center in San Francisco, Denver, Los Angeles, Chicago, and Washington DC and from Australia, the airline moves to the Western Coast of the United States. It is the principal subordinate of the UAL Corporation, and it's headquarters is in Chicago, Illinois. Star Alliance group of airlines has United Airlines as its constituent. United Airline Business Class Flight provides beverage service during Pre-departure. It avails complimentary amenity kit. In a United airlines Business seats, there are room for work and relaxation. It offers two short-subject channels and nine video channels. It includes audio programming up to 19 channels. It offers flight tracking channel. It also provides with Noise-reducing headsets. Includes local cuisine, menus featuring option of three entrees are made available. During evenings, flights after 6 p. m. to Europe, avails Express Dine meal service. Desserts, liqueurs, Starbucks coffee, fruits & cheeses, Premium wines and ports is offered. Between U.S. and Japan, one is provided with Traditional Japanese meals. Charlie Trotter, the world-renowned chef has designed the Exclusive menu. A passenger of Business Class United Airlines gets priority to check-in. Priority in boarding, bag delivery and deplaning. 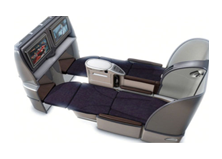 Business Class United Airlines is the initial U.S.based airline to provide seats which switched to beds that is truly flat.This is a major breakthrough for United Airlines which provides fully reclining lie-flat seats in thier Business cabins. The seats are designed to offer extra space and a enhanced sense of privacy through an innovative forward and rear-facing design and seats that recline 180° to form a six-foot-long bed.The passenger can also have a comfortable sleep throughout the flight. These services by Business Class United Airlines are presented on flights between New York (JFK) and Los Angeles or San Francisco. During summer, 2008, Business class United Airlines declared its novel "Travel Options by United" program, which allowed the passengers to modify their voyage by adding up suitable services to their itinerary. The services include Premier Line, which provide fast track entrance through airport lines, and Door-to-Door Baggage Service, where Fedex Express picks up your baggage and transport it during the night to your ultimate destination. Media Players including an instinctive 7-inch touch screen, 40 audio CDs, 22 television programs, 27 motion pictures, noise-reduction headsets and five video games. Outstanding meals, a variety of wines,Starbucks coffee and beverages.